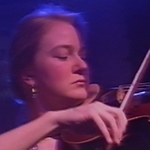 Natalie Box played violin with The Divine Comedy in 1993-1994. She joined at the time of the making of Promenade and played on the album was well as during the Liberation tour along with Chris Worsey, and then on the Promenade tour in 1994. After The Divine Comedy, she played for other bands including No-Man and Cardiacs.